Good evening fellow foodies! After torturing you for a week now after posting those scrumptious donuts on my instagram it is about time to get down to business. Well I have good news for you: It is incredible easy to make these! 2. Add the milk/vinegar mix, salt, sugar & the vanilla extract. Ensure to only heat the mixture, but do not boil it. 4. In another bowl, mix the flour and the yeast, then slowly add the cooled liquid ingredients. 5. Mix the dough with your hands and then knead it on a floured surface for about 5-10 minutes. 6. Leave the dough to rest in a warm place for about an hour. I recommend letting it rest in a bowl covered with a wet (and clean!) tea towel. Within this time the size of the dough will roughly double. 7. Once the hour has elapsed, roll out the dough about 2cm thick and cut out the outer circles of your donuts. Bear in mind that they will still grow in size, so I would recommend not making them too big. 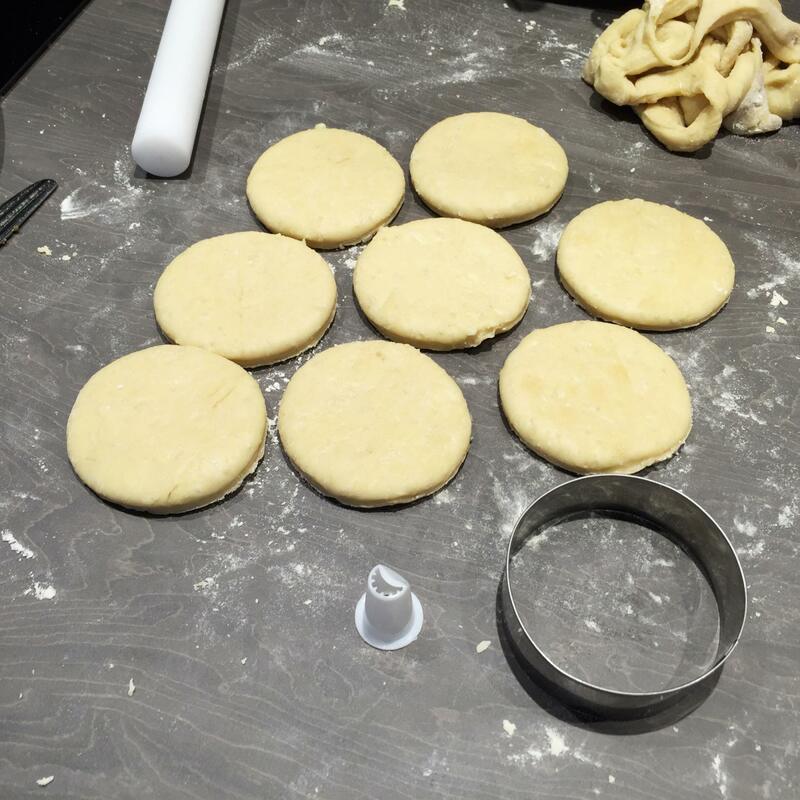 I used a regular round cookie cutter for my donut size. How many donuts you will be able to make off the dough is of course down to the donut size you choose. 8. 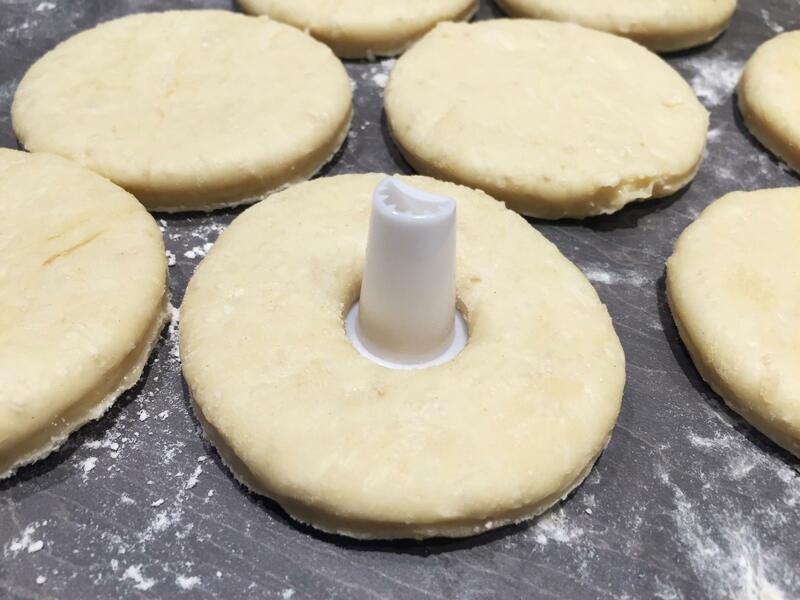 Using a sharp round tool cut out the holes of the donuts. Don’t make the holes too big, but of course this is totally up to you. I actually used the nozzle of a piping bag as I did not have anything else fitting the size. If you have bigger donuts, you can also use a shot glass to cut out the holes. 9. 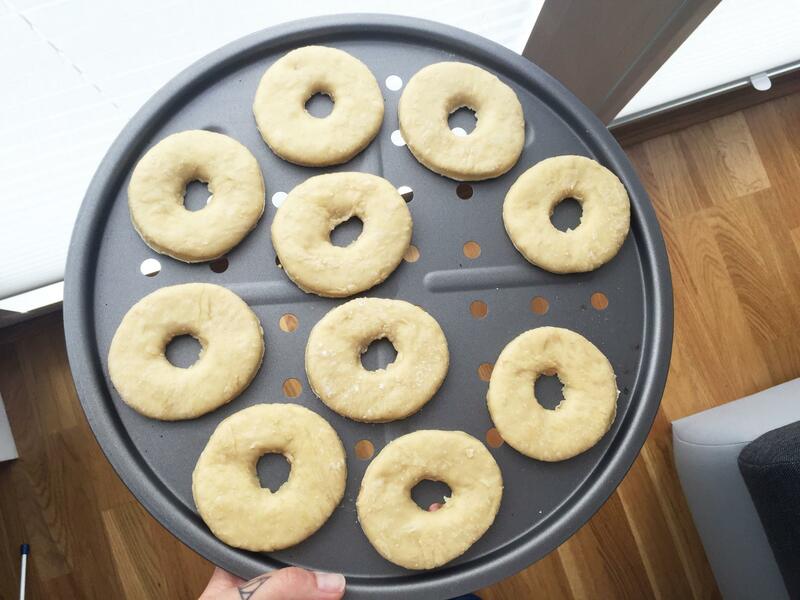 Leave your donut shapes to rest for another hour. Do not throw away the donut holes! These make perfect mini donut bites! 10. Now fry your donuts (& donut holes). If – like me – you donut own a deep fryer (See what I did there) just take a pan with a lid and fill it about 2-3 cm high with oil. The pan does not need to be huge, you can take a small one and fry the donuts one after another. Wait for the oil to be properly hot before you let the first donut in. I recommend putting the donuts in with a soup spoon and then covering the pan with the lid straight away to avoid splashes from the oil. 11. Ensure to turn each donut after about 20-30 seconds so that they get equally fried from both sides. 12. Once ready, take out your donut let it cool down on a cooling rack. Repeat until all donuts have been fried. I recommend letting your donuts cool down for 20 minutes, but you do not need to wait longer than that to decorate your donuts. 1. For the perfect glaze you need powdered sugar and a little bit of liquid. It is impressive, but you actually only need a tiny amount of liquid for big amount of topping. For a lemon-y taste use lemon juice – if you are not a fan of lemons or simply do not have any in the house, use water. 2. Ensure to mix it into a thick paste. If it is too liquid, add more powdered sugar in the process. If you try to top your donuts with a very runny mixture, it will drop of your donut straight away, leaving only a see-through layer of topping (unless this is what you want). So mix it thick! 3. You are welcome to add food colouring. 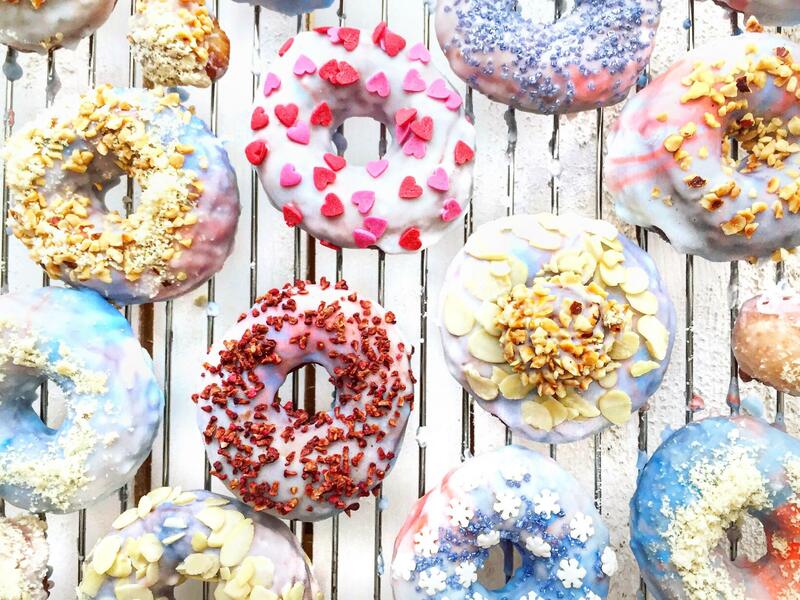 If – like me – you want your donut glaze to be a blend of different colours, divide the sugar mixture into separate bowls and blend in a different food colour into each of them. Then carefully put a few drops of each colour onto the surface of a white sugar mixture and gently (&briefly) mix with a stick or fork. Do not mix it to much – one swirl is already enough as we do not want to mix it completely. 4. Dip your donut face-down into the mixture, carefully take it out and place back on the cooling rack. Repeat with the rest and also the donut holes. 5. 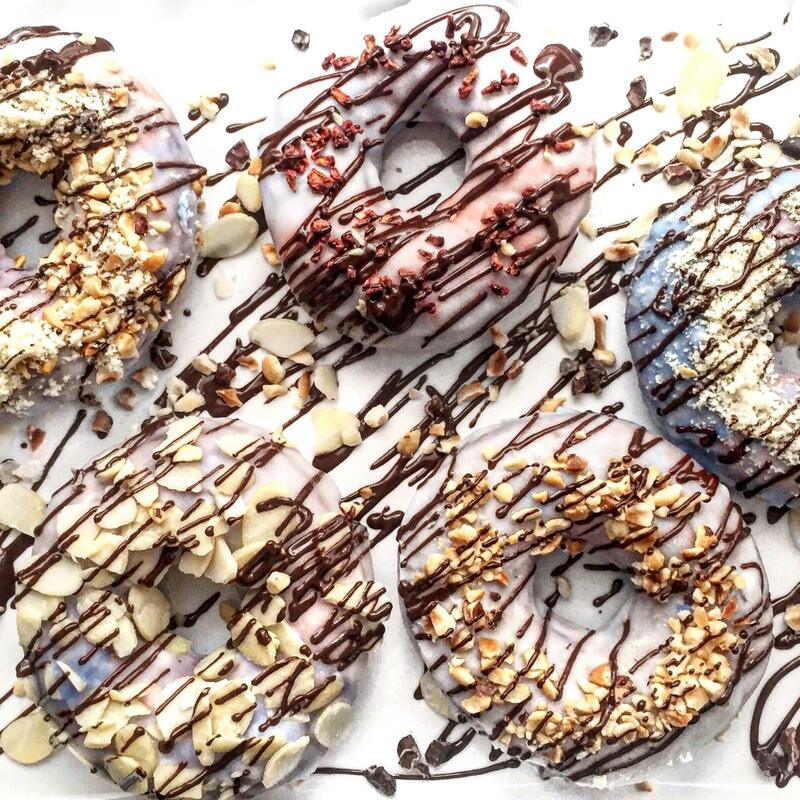 To make them extra pretty drizzle with different toppings: different types of nuts, chocolate sprinkles, actual sprinkles (make sure they are vegan!) – be creative! The more different options you put together, the prettier they are going to look in combination! Let the toppings dry completely before serving the donuts – it takes patience, but believe me – it will be worth it! Send me some pictures of your donuts! Would love to see which toppings are your favourites.